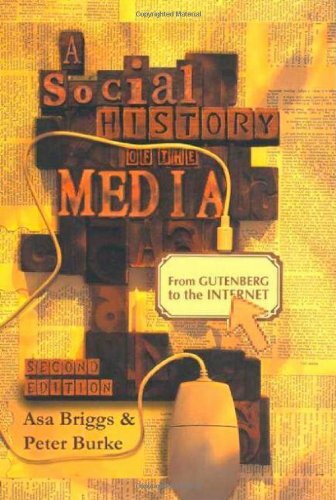 Amazon.com description: Product Description: Written by two leading social and cultural historians, the first edition of A Social History of the Media has become a classic textbook, providing a masterful overview of communication media and of the social and cultural contexts within which they emerged and evolved over time. In this new and revised edition, Asa Briggs and Peter Burke have updated their classic study to cover the exciting media developments of the early 21st Century. In addition to the classic material exploring the continuing importance of oral and manuscript communication, the rise of print and the relationship between physical transportation and social communication, a new chapter on multimedia now extends the far-reaching scope of this book. New media technologies are treated in new depth throughout the latter sections and the book concludes with an account of the convergences associated with digital communication technology, the rise of the internet and the phenomenon of globalization. Avoiding technological determinism and rejecting assumptions of straightforward evolutionary progress, this book brings out the rich and varied histories of communication media. It will be an ideal text for students in history, media and cultural studies and journalism, but it will also appeal to a wide general readership. It has already been translated into more than ten languages.